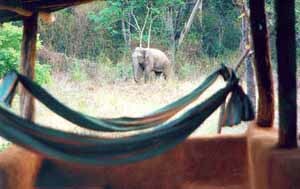 If you’re ready to see Sri Lanka in the raw you should take a trip back to nature at Tree Tops Jungle Lodge. Set in the Weliara wilderness bordering Yala National Park, this simple rustic lodge offers a village style atmosphere; thatched unfenced clay huts are discreetly integrated with an awesome landscape of rocky hills, scrub jungle, tall tropical dryzone forest and lakes. With 160 recorded species the birdlife is unique, and wild elephants have their tracks right through the premises of the lodge. Guests are even warned to arrive by mid afternoon to avoid possible confrontation with an elephant on the drive way. The Tree Tops project at Weliara began in 1997 as a private jungle hide-out and gradually became a base for environmental activism combining material minimalism with spotless service. The commitment is to preserving the remaining forest and wild life, teaching its methods and philosophy and encouraging and supporting the local economy to find a way through the human/elephant conflict. The Danish -owned Lodge is staffed by trackers, a cook, night watchman and others to ensure your well being, while you wallow in the silence, walk the surrounding hills and forests, view the elephants and birds and generally leave the commercial world behind. Buttala, Sri Lanka December 15, 2008 -- Sri Lankan Tree Tops Jungle Lodge has been honoured with the Wild Asia Responsible Tourism Award 2008 at an award ceremony in Kuala Lumpur, Malaysia. Tree Tops is a basic mud- and tree-hut ecolodge entirely run and managed by staff recruited in a remote community where hunter-gathering is the traditional lifestyle combined with slash-burn farming. Situated in lowland Uva, 10 km from Buttala, the lodge is located in dryzone Weliara bush jungle in Southeastern Sri Lanka, a wilderness and slash and burn cultivation area connected to Yala National Park. The award winners were selected after six months of short-listing the finalists and as a unique feature for awards, the final eight properties were inspected by Wild Asia representatives. This year Wild Asia introduced a new set of criteria which included: 1) Sense of place -- whether tourists understand their destinations better through operators' efforts. 2) Sustainability -- whether these efforts are long-term. 3) Involvement of guests -- do the operators involve their guests in their practices? 4) Internalization -- how much is sustainability part of the day-to-day operations? Dr. Reza Azmi, Director and Founder, Wild Asia, who checked out Tree Tops Jungle Lodge, commented: "What's great about the Awards is we always find a gem - a property that challenges us in our evolving views of what makes a 'sustainable' business. I had a preconceived idea of Sri Lanka's Tree Tops Jungle Lodge as yet another wildlife lodge but what we discovered was how local everything was. From the design of the mud huts to the entire wildlife experience. Despite being a small operation, the lodge serves as important business, educational and conservation catalysts for the area". "The Wild Asia Award is an incredible encouragement for me and my team as well as attracting well deserved international attention to Sri Lankan ecotourism" - Lars Sorensen said, Chief, Tree Tops Jungle Lodge. Explaining what makes Tree Tops special, Lars Sorensen adds: "The jungle lodge vision developed from 2001 was quite a daring combination of adventure, experience and minimal facilities. However we went our own ways and have proven to be a world class Sri Lankan ecotourism product in terms of real and authentic experience. Our concept is tailor made for the particular area and aims to preserve local culture, nature and wildlife - call it 'living in the wilderness with local people'. The concept puts weight on the human resource part and environmental conservation rather than the actual physical hotel. Organization and service make the magic more than conventional comfort". This is all depending on the preservation of the surrounding nature because living amidst jungle, birds, spotting leopard paw marks and observing an occasional wild elephant is the core attraction for visitors". Initiated in 2006 by Malaysia based conservation group Wild Asia, the Awards showcase exemplary Asian ecotourism ventures that are committed to sustainable practices. This year's Awards attracted a diverse group of tourism operators from Malaysia, Thailand, Indonesia, the Philippines, Laos, the Maldives, Sri Lanka and India. Wild Asia organized various learning seminars attended by pioneers of Asian nature conservation and leaders in ecotourism from the finest Asian eco-chic resorts to basic community based accommodation places.